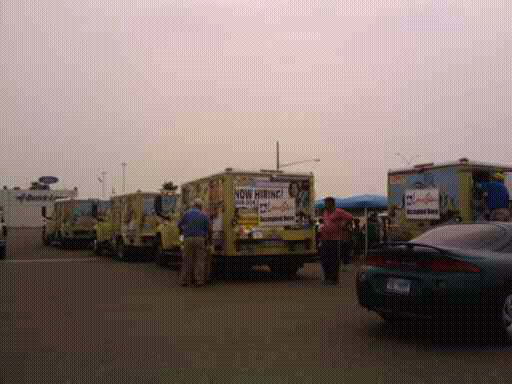 Picking up our pizzas from Schwan's trucks at the Spikes Ford parking lot. Music, fun, live animals and entertainment await children of all ages at South Texas College's Third Annual Environmental Education Fair. The Earth Day Celebration will feature Eco-friendly hands-on arts and crafts as you walk through the woods on Saturday, April 16, 2011 from 10 a.m. to 2 p.m. at the Frontera Audubon Society located at 1101 S. Texas Blvd. in Weslaco. The event is free to the public. The Third Annual Environmental Education Fair: Celebrate Earth Day is sponsored by South Texas College, Frontera Audubon Society, STC's Mid-Valley Campus Biology Club and Education Department, the Weslaco Lions Club and Kohls. "The goal of the event is to teach our younger generation to be aware of nature and to understand how humans and wildlife share the environment," said STC MVC Biology Lead Instructor Debbie Villalon. "We want to showcase local natural resources, such as Frontera's 15 acres of natural habitat, through entertaining, educational activities." "South Texas College has a strong commitment to outreach for children and the fair is a great way to show children how they can take what they learn and apply it to their lives," added Villalon. "The event stresses recycling and how to create, provide and enhance wildlife habitats." A Bird House Competition, sponsored by STC's MVC Biology Club, will be judged during the event, with the people's choice award, and first, second and third place trophies and ribbons in three categories. Entry forms, a $10 entrance fee, and bird houses must be submitted by April 11. "The Bird House Competition is a great way to create a habitat for birds," Villalon said. "This and other hands-on learning activities show how preserving and protecting our environment can easily be incorporated at home." For more information about the "Celebrate Earth Day" Third Annual Environmental Education Fair or the bird house competition, e-mail Dr. Villalon at dvillalon@southtexascollege.edu. 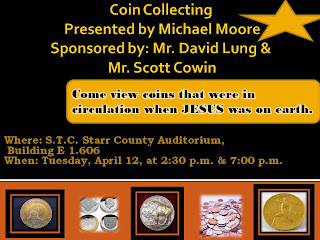 Another STC night planned April 20 at The Zone! The first STC night was such a huge success that we are planning another. Mark your calendars and get ready to join Alumni and Friends Wednesday, April 20, from 6 to 9 p.m. at The Zone Action Park, 2600 W. Expressway 83 in McAllen. You get great savings when you say you're with STC…a $17.99 value package for just $5.99. The "Jaguar Green VIP Wristband" gets you unlimited miniature golf, bumper boat and go-kart rides. Or if you'd rather just play miniature golf, you can purchase the "Jaguar Purple Wristband" for just $3.99. Both wristband packages include a $1 game card that can be used in the game room. The offer is only valid for the three hour period on the day of the event. A portion of the ticket sales will benefit STC Alumni and Friends. The organization raises funds for scholarships and for different benefits for students at all campuses and within the community. So please spread the word… and bring your friends and family out for three hours of great fun. Be sure to wear tennis shoes and comfortable clothing. Sandals without straps and flip flops are not suitable or safe for the rides. Height restrictions apply for small children on the rides, and children under 12 years of age must be accompanied by an adult. For more information on height and other restrictions, visit The Zone's website http://www.thezoneactionpark.com/ and click on the speed and splash zone sites. Food is available for purchase in the restaurant, which provides a great selection of pizzas, wings, drinks, ice cream and other snacks. The Zone Action Park is a 12-acre family entertainment park that includes speedway go-karts, water squirting bumper boats and two 18-hole tropical landscaped miniature golf courses, which are included in the $5.99 package. The park is located on the north side of Expressway 83, between 23rd and 29th streets. NOTE: Batting cage use, food and additional video games (after the $1 game card is used) must be purchased separately and are not included with wristband packages. Anniversary Celebration of the U.S. Civil War that the Mexican American Studies Program and Division of Library Services are co-sponsoring. Admission is free and open to the public. 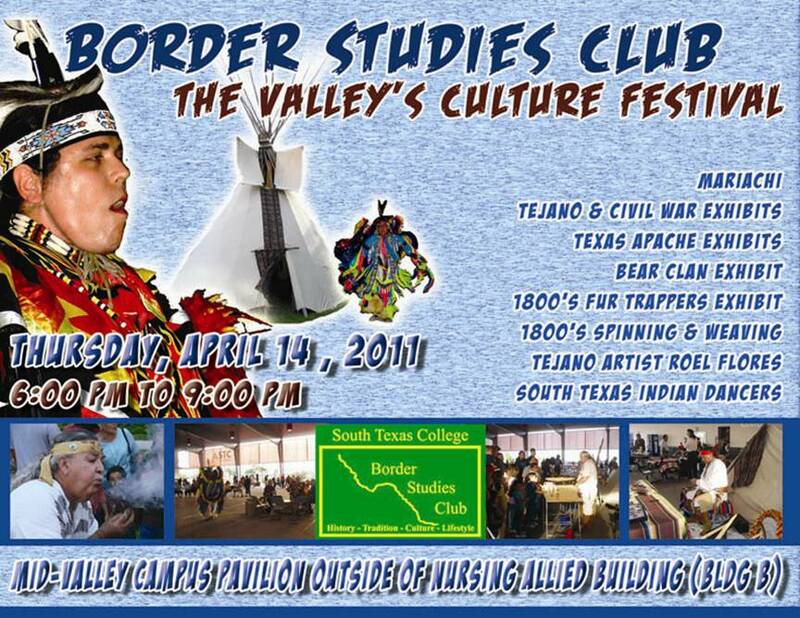 For more information contact Victor Gomez at vgomez@southtexascollege.edu or 956-872-6485. South Texas College's Business Administration Department is lauding the efforts of Rio Grande Valley business women through a new speaker series highlighting how they have broken the glass ceiling to become very successful business owners. In this third installment, hear from speakers Sally Cuellar of Coldwell Banker- La Mansion and Lorena Tijerina of STC's Plumbing Program. Admission is free and open to the public. 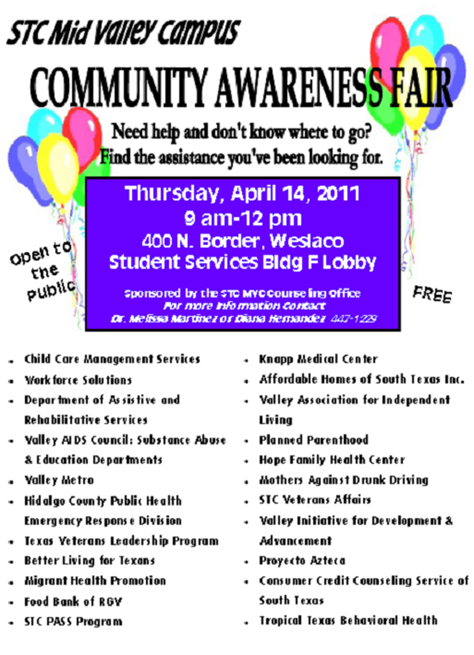 For more information contact Roz Moore at ramoore@southtexascollege.edu or at 956-872-6132. See original films shown for the first time including a dramas, comedies, tragedies, romances, satires, parodies and experimental cinema. The winners will be decided 50 percent by a jury of film personalities and 50 percent from audience-participation ballots. 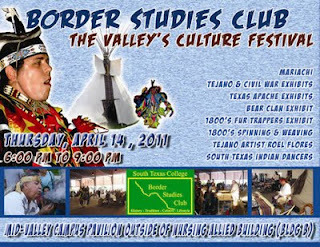 Awards will be provided by South Texas College Book Store Barnes & Noble at recognition of the films on May 8, 2011. Admission is free and open to the public. 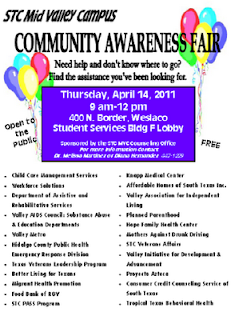 For more information contact Tom Fuschetto at tomf@southtexascollege.edu or at 956-872-3487. Music Instructor Daniel Cather will perform Ludwig van Beethoven's "Tempest" Sonata No. 17 and Scott Joplin's Fig Leaf Rag. The recital also features STC's Jazz Combo performing three original pieces composed by Cather. Admission is free and open to the public. For more information contact Cather at dcather1@southtexascollege.edu or 956-872-2046. Need more information about South Texas College? Want to be added to or taken off the newsletter distribution? Contact Helen Escobar, coordinator of public relations, at 956-872-8359 or hjescoba@southtexascollege.edu, or Edgar Chrnko, PR specialist, at 956-872-8358 or echrnko@southtexascollege.edu. I'm not certain; I think yesterday was the first 100 degree weather for the year. That came out of nowhere. I was expecting temps in the 90s. Hope April brings us some showers. The ground is dry. Dust is flying everywhere. We need rain to keep the heat from bringing is drought.